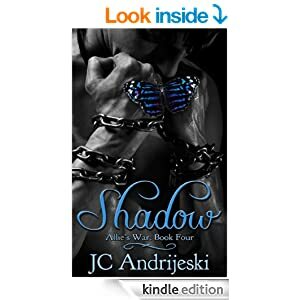 Shadow, Allie’s War Book Four, J C Andreski. Well, I’m fully immersed in this series now. Each book is long – great 🙂 so we can really feel as if we know the personalities by now, even those multiple ones are beginning to be clear in my mind….This book did something to me not many do – it actually made me cry, when yet again Allie and Revik have problems. I love novels that move me emotionally, and though I’m often choked up if the story is good enough, it’s rare that I actually get the tears – but JC managed it. So, we left with Allie having abducted Revik for some deprogramming – that’s the best way I can think of it. His mind, light etc. are filled with Dreng machina, making him dependent on them to survive, and Allie feels he needs to be himself and independent. The problem is that’s not an easy task, he’s been messed with so many times no-one is quite sure what or who is the “real” Revik, and its a big risk to his life, and to Allie and of course she knows the new version may not want her. After all she’s had to betray his trust to get him where his is…she’s hoping though that the love they shared will survive, but the actions she has to take bring her and Revik to breaking point, both physically and emotionally. She’s almost alone in wanting to try to bring him back, most of the others fear he’ll become feral and that it’s best to kill him now, but Allie persuades them to give her a chance. Of course while all this is going on that B itch Voi Pai is making her moves. I knew we’d not seen the last of her. She was supposed to have a deal with Allie, but under the usual guise of politeness manages to hold as “guests” some of Allie’s people, and won’t release them, and the other seers she should have set free as agreed with Allie but didn’t, until she comes to speak with her personally. That’s not easy with what seems like everyone out to kill her or collect the bounty on Allie, and knowing she’s most likely walking into a trap. Still, that’s never stopped her before when someone needs her. .
Once again a book full of action, drama, personalities and clashes. I loved the emotion, we saw lots of Revik’s background via his treatment, and Jon came more into play more in this instalment. I like Jon, at times he’s a voice of sanity in what seems like a mad world. His conversations with Revik while he was undergoing treatment were very interesting and enlightening. So its on to book five now, and more mysteries to come… I love to read a series this way, back to back so that each issue is fresh in my mind. When I’ve a favoured series that’s all/mostly out sometimes I do just that, re read my way through all of them ( I’m currently doing that with Patricia Briggs Mercy Thomson series, in between review books) and I often find I pick up things I’d missed because of the long gap between releases. Its priced at £4.11 for 528 pages, and its all good stuff, not fluff anf filler padding! Stars: Five, all the way!